Seeds from India sound like a good deal ,, especially not wanting money until after delivery. Can't do thatr here in Aus ,, but that's ok. The good thing is once you get a tree suitable for your climate ,, each year you can use it to make more and more cuttings ,, and you are 100% sure cutting will suit your area. But remember that cuttings don't have that long tap root , so they will be less drought tolerant and may even need a "stake" if in windy areas. Can't do it here in SA either.... so I was surprised. But that is how he does it. Really neat. We can on occassion have some pretty strong winds here. We had to cut up fallen trees to unblock the road earlier this year... so you make me glad I have ordered more seeds. I didn't know that about the tap root. Interesting. I'll have to wait for my own seeds in time... and plant those for trees very suited to my climate. All truth passes through three stages. First, it is ridiculed, second it is violently opposed, and third, it is accepted as self-evident. Many thanks Chappo! I have written him. Remember how I noted that earlier this summer only one of my moringa from last year grew back. Well more of them grew back later, They waited till like late summer to come back!?!?!?! Well anyway it seems that about half of the ones planted in the ground last year came back this year. I have another batch that I planted in the ground this past spring and I've had to chop most of them off a couple times now to keep them short enough. 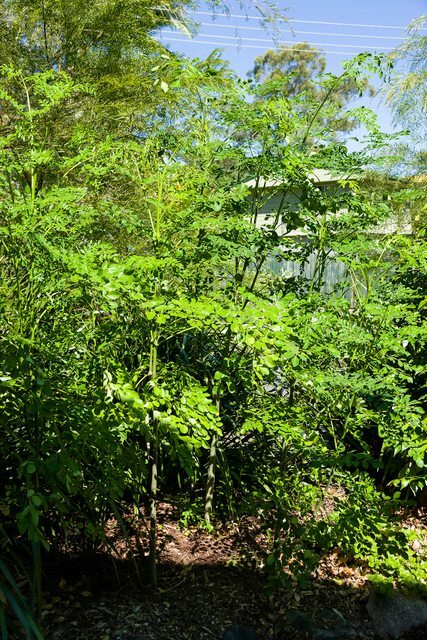 The chickens and fish will eat a little bit of moringa leaves if they are hungry but they generally go for the other food first. I have also found that feeding moringa to the fish causes me problems with the leaves and small stems clogging things up. When I have more than I can dry at a time, I just drop the excess pruning around the banana plants and any other greedy dirt plantings as a high nitrogen mulch/fertilizer. Kinda the chop and drop method. 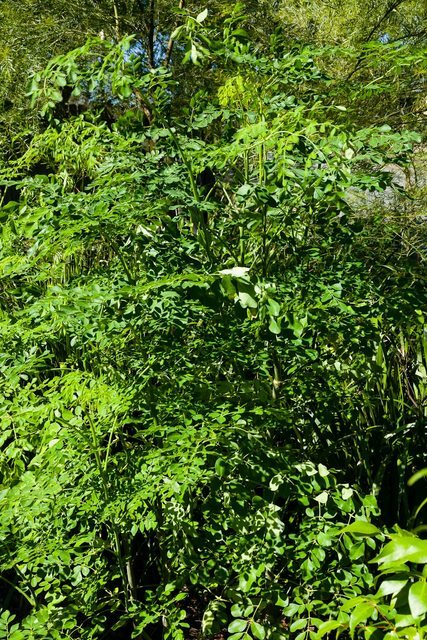 I am here because I was considering moringa as fish food and some other uses in the process, but when i did some research I realised that I have a tree that looks like this genus. I am also suspicious that I may have the weed variety because it drops seeds everywhere and seedlings pop up in the most unusual places - especially ones I don't want them growing in. they're easy to cut down but gah they really grow. My tree is about 5m tall and produces those same flowers but pink instead of the yellow. Well, as being concern for tomorrows need, food is the first thing that comes to mind and if the food is rich of nutritious value than it is very good for health. In that moringa is considered as the best food to eat for healthy growth. Tass 1 has them from time to time. I have been growing Moringa in the Wheatbelt now for 2 years. Such a productive tree that would be perfect for the home aquaponicist. I placed a post on Freecycle asking for seeds or cuttings of Moringa Olifera and had a few replies. I have 5 seedlings growing now. I will bring them under the patio so that they are not exposed to any frosts over winter. There are other Freecycle groups around the world. Google "Freecycle" with your Capital City or other City name to locate groups close to you. Any updates here? How did everyone go using them for 'other' needs? I grow it at home (first season), 9 plants and they are about to flower. I have one of the two seedlings I ordered surviving and still in a bag. Has started to flower, may have to look at digging a hole tomorrow.